When Nancy and I lived in Dallas, back in the early 80’s, we managed to get to Austin, Houston, and Galveston, but we never made it as far as San Antonio. Dallas and Houston didn’t do much for us back then, but we did like Austin and folks had told us that we would like San Antonio, too. Thus, we were a bit jealous when our son John made it there before we did. John, as a member of the Oregon State University marching band, was there last New Year’s to play in the Alamo Bowl. The band was housed in the Embassy Suites just off the Riverwalk, and between practices they were given free rein to do some exploring, so explore they did. John’s description of the place just served to cement our desire to see San Antonio for ourselves. So much so, in fact, that that desire became the genesis for this whole trip. Once I realized that San Antonio was reachable by Amtrak, Nancy and I started talking about where else we could go, and thus the trip we are now on was born. Given that, it is a bit funny to consider just how little time we ended up having in San Antonio proper. Owing to the events that occurred on our drive down from Waco, we didn’t end up getting to San Antonio until late that afternoon. After we managed to get the car squared away, we took a short taxi ride from the hotel containing the Hertz office to the Hotel Valencia, where we had reserved a room for the night. From the street the Hotel Valencia looks like a classic old building, with a thick metal overhang protecting the entryway from the direct rays of the sun and any inclement weather. Look up however, and it quickly becomes apparent that the building has been modernized using materials that give the upper nine stories a faint Spanish feel. As we stepped inside, our impression of the place changed once again: the interior of the hotel is done up in a severe, modern style, using metal, glass, and concrete. Our fourth-floor room was similarly decorated, with a giant free-standing mirror leaning against one wall and a long, shallow countertop running the entire length of the opposite wall to serve as a desk, dressing table, and a place to put luggage. Our small balcony looked out over an inner courtyard; while we could have gotten a river view, this option was both cheaper and quieter. The king-sized bed, though comfortable, had a heavy dark wood frame that extended a couple of inches from the mattress on the lower corners; I quickly positioned a stool next to one corner knowing that otherwise I’d be barking my shins every time I walked by. Once we settled our things, we changed into nicer clothes and went for a walk. We first stopped outside the front entrance, where we had the bell captain arrange dinner reservations at what he said would be a pricey, but quiet semi-upscale steak place just a half a block down the street. We then noticed a handful of motorcycle cops driving up and stopping in the street in front of the hotel. Waiting to see what this was about, we soon realized that there was a small immigration protest going on. It being “May Day,” I suppose that this was appropriate. 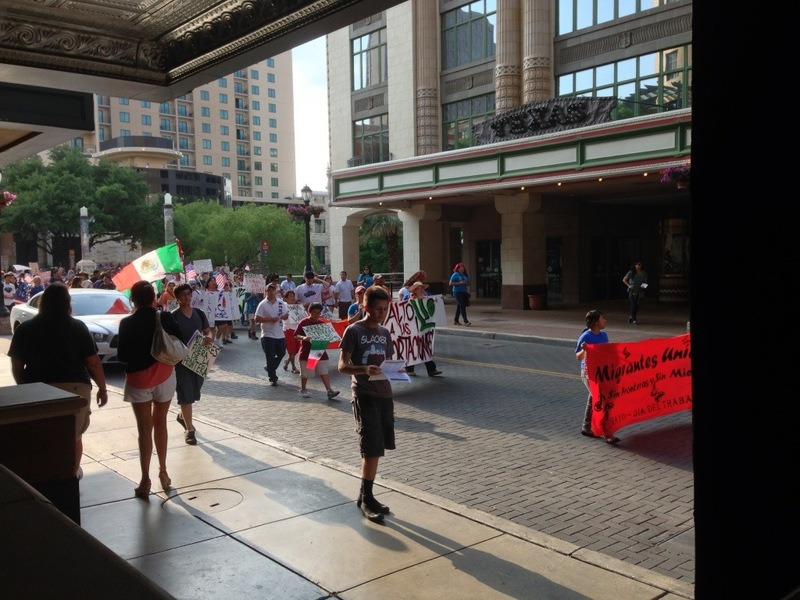 The marchers were a peaceful mix of Hispanics and Anglos, although all of the signs seemed to be in Spanish. The chanting, too, was in Spanish, although at the tail end of the parade there was a guy inviting us to join in the “May Day Celebration.” I didn’t think for a moment that he didn’t really know what the parade was about, but perhaps he thought we would be fooled and might inadvertently swell their ranks. We declined, but headed off in the same direction (using the sidewalk) since they were heading straight for the Alamo, our intended destination. San Antonio is very conveniently laid out in that the Riverwalk–where a lot of the interesting restaurants, bars, and hotels are–is mere blocks from the Alamo, Texas’s “greatest historical attraction.” If you’ve seen an old Catholic mission or two you likely won’t be too impressed with the outside appearance of the Alamo, since that is exactly what it once was. Unfortunately, by the time we got there it had closed for the day, so we had to content ourselves with peering in through the gates and admiring the gardens in the inner courtyards. I did grab a brochure, however, so I was able to learn a bit about the important part the siege of the Alamo played in the Texas Revolution. Turning from the Alamo, we walked about two blocks and then descended a flight of stairs down to the San Antonio river and the Riverwalk. The river itself is relatively narrow–about two traffic lanes wide–with sidewalks running most of the way on either side. There are numerous restaurants with open-air seating adjoining the sidewalks. All of this is about one story below street level; it is actually a bit difficult to see the Riverwalk from up on the street. Unless you are right on top of it, you’ll want to rely on the many small signs that direct you to one of the numerous access points. The Riverwalk itself is mostly as you might imagine, although I was pleased to see the abundance of greenery and the well-placed trees that provide some welcome shade. There appeared to be some nice restaurants on the river, although most seemed to be the type that you might find in any hot spot frequented by loud, affluent thirty-somethings: the kind of place that serves bottled beer with a lime wedge in the neck and margaritas dispensed from a machine. Not the kind of place we were in the mood for at that moment. As our dinner reservation wasn’t until 8:30, we strolled the Riverwalk looking for a good spot to sit and have a drink and possibly an appetizer. Although the many open-air patios and decks looked attractive, the heat and humidity made things uncomfortable enough for me that I wanted something indoors, and well air-conditioned. As it was, we had to duck into a store or two to cool off before we found a suitable spot. We eventually settled on the Esquire Tavern, mostly by luck, since further research led us to understand that it is one of the best bars along the river. The Esquire Tavern is actually at street level, so we had to climb a metal staircase to access it from the Riverwalk. Once inside, we couldn’t actually see the river (they have a balcony, but again the heat and humidity ruled that out), but inside it was cool and dark, which was exactly what we needed (along with a drink!) to help take our minds off the unpleasantness from earlier in the day and once again allow us to focus on where we were at that moment. 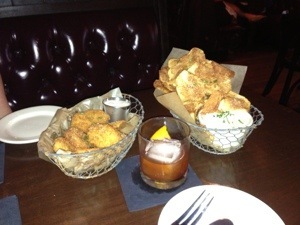 Along with our drinks we ordered their Texas Onion Dip (with homemade waffle potato chips) and their famous deep-fried dill pickles, which were surprisingly good. We couldn’t finish either appetizer, but enjoyed the bits that we did eat. Definitely recommended! 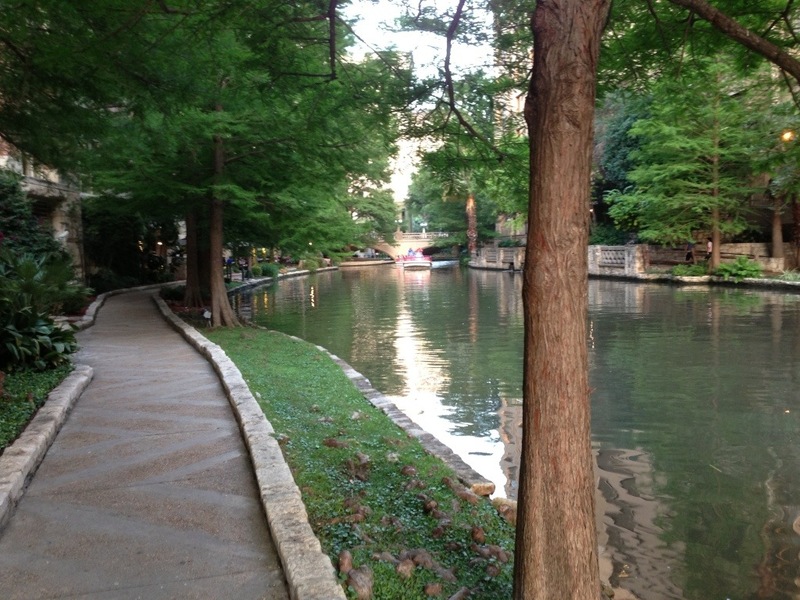 We left the tavern around 8:00pm and continued strolling along the Riverwalk. We came across a neat outdoor theater in which the stage is on one side of the river and the audience sits on concrete steps on the other side. As it wasn’t in use on the day we were there we were able to walk right through and continue on upriver. Even at 8:00pm it was still too hot and humid for me. As Nancy had to duck into a drugstore to buy some postcards, I went in with her just to take advantage of their air conditioning. Cool once more, we then finished up the current section of the river and then headed off to our dinner reservation. The hotel bell captain had suggested and arranged dinner for us at Bohannons, a high-end steak and seafood place. As we opened the door we knew that this was just what we were looking for: the room was dark and quiet, with a bar extending a long way along the right wall. There were two small groups ahead of us talking to the hostess; both were turned away as they didn’t have reservations. When it was our turn I gave her our name and held my breath, hoping that the bell captain had made the reservation properly. I needn’t have worried as our name was indeed on the list. She then walked us to the back of the room and directed us to an elevator: it turned out that the entire downstairs was just the bar, and that the restaurant itself was upstairs. When the elevator doors opened on the second floor, I momentarily wondered if we were in the right place. The restaurant was everything the bar wasn’t: as the doors opened we immediately noticed the noise level, which was significantly higher than downstairs. As well, the room was painted in light colors and the floors were a blond wood, which served to make the room both light and loud. The tables had white tablecloths, and the decor was elegant, but someone needs to teach the residents of San Antonio to use their indoor voices! But those aren’t the extent of the steaks on offer. After we had each selected a glass of wine, a “meat steward” came around with a large metal tray containing roughly a dozen different cuts of meat sealed in clear plastic wrap. These are the highest-end cuts: the Kobe beef steaks and such. He then proceeded to spend ten minutes or so describing them to us in great detail. He certainly did a great sales job: we ended up selecting an 18 ounce bone-in filet from his tray to be split between us. We also ordered asparagus with Hollandaise sauce, some of which we poured onto our steaks. Finally, we ordered salads, which proved to be a bit too much; Nancy’s Caprese salad, in particular was huge. It could have served as a meal unto itself. But the salad used fresh and local heirloom tomatoes, and they were possibly the best tasting tomatoes we’ve ever had. The food was wonderful, and eventually, due to the relative lateness of our dinner reservation, the restaurant got somewhat quieter as other diners finished their meals and left. We had no room for dessert, of course, although we were disappointed to have to say “no” when it was offered. After a short walk back to our hotel, we made sure that our bags were ready to go and set an early alarm: our train was due to leave San Antonio at 7:00 the next morning. The bed being extremely comfortable, we went quickly to sleep, only to be awakened several hours later by a loud crash of thunder. A storm had been forecast, and it had come in with a vengeance. The wind howled outside and whistled through cracks around our balcony door as the storm approached. Periodically we’d hear a loud clap of thunder, and eventually the rain began to fall. We were snug and warm in our hotel room, though, and only half awake, so it was fairly easy to ignore the tempest outside and get back to sleep. Morning was dawning as our 5:30am alarm went off. We were glad to note that although the ground was still wet, the storm seemed to have passed and it was no longer actively raining. We quickly showered and dressed, and then called downstairs to have the bellman flag down a taxi for us. 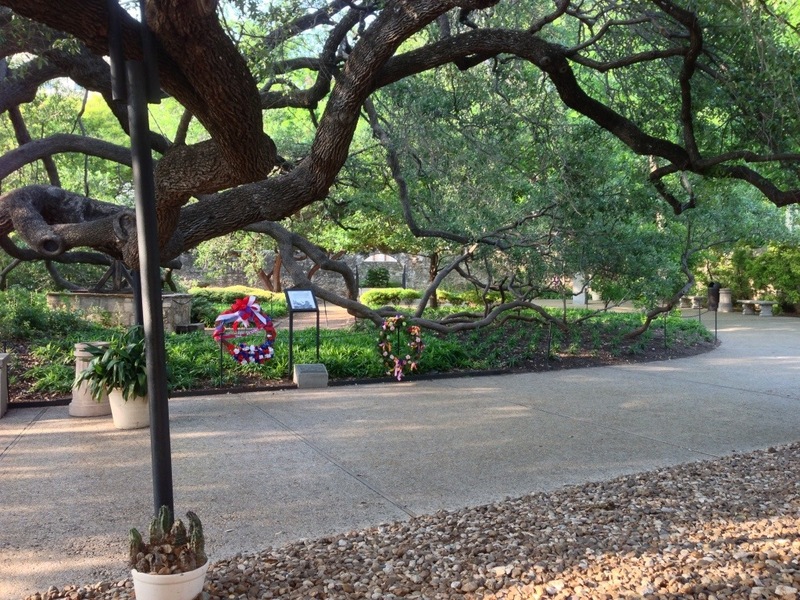 A few minutes after we had hauled our bags down to the street, we were in our taxi and on our way along the mile-and-a-half journey to the San Antonio Amtrak station. As we pulled up, we were delighted to see what appeared to be our train sitting in the station. It was indeed our train, although boarding didn’t begin until 6:45am (for a 7:00am departure). As we had a reserved bedroom onboard the train, we didn’t bother queuing with the coach passengers (who don’t receive their seat assignments until they check in with the conductor prior to boarding) and instead found seats inside the station. Once boarding had begun and most of the line had been dealt with, we joined the queue and rather quickly found ourselves in car 220, room D. Another full bedroom, ours for the duration of the day-and-a-half-long trip from San Antonio to Chicago. Although I wish we had had more time in San Antonio, we made the most of the time we had and we basically did what we had wanted to do. If we had gotten there on time we would have spent some time inside the Alamo, although I’m not sure we missed all that much. I’ve heard mixed reviews from people who have been there, and I am sure that there are many books that I could consult if I decide I want to learn more. 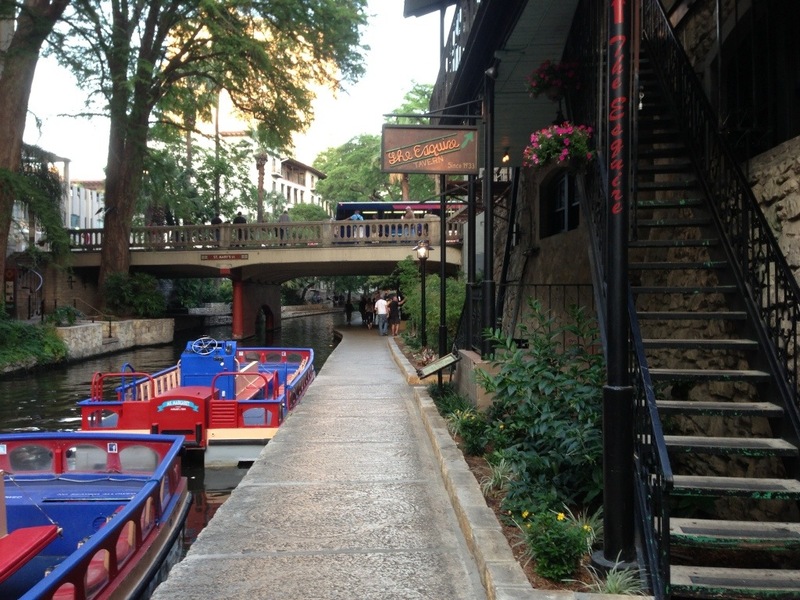 As for the Riverwalk, that is something that San Antonio can be justifiably proud of, although I wouldn’t go to San Antonio just for it. If we have a future occasion to change trains in San Antonio I will definitely schedule an extra day or two to do some more sightseeing, but I think otherwise I can cross San Antonio, Texas off our “must see” list. This entry was posted in An Amtrak Grand Tour on May 6, 2013 by Greg Wilson.